With the advent of homeschooling in our house, my schedule had to readjust somewhat, now that I have three school aged children at home full time, along with the mini munchkin. One activity that we still attend is our church playgroup that I help run each week, which the big boys like to help out with as well. But like the mean old mummy I am, I prefer they don’t join in the craft – my theory is, playgroup is for the littles, they are just the ring-ins who only come because they are at home. 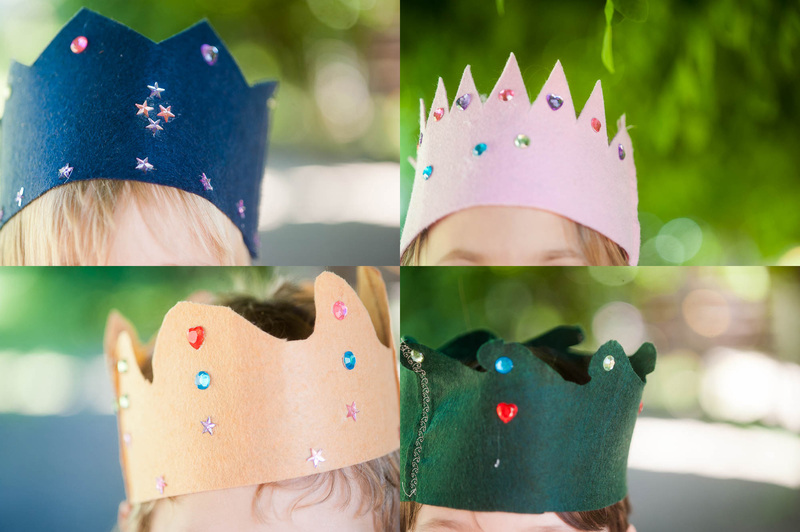 Last week, we made crowns, and the little kids had a blast. My poor deprived big kids were a bit glum at missing out, so on the way home we swung by the cheap shop, and picked up 4 pieces of felt and a bag of sequins, and headed home to make our own! These were super easy – we folded the felt sheet in half to match up the long edges, and cut in half along the fold. We then laid one end of a half over the end of the other half, and sewed either with a zigzag or a decorative stitch, and this long piece was then wrapped around their heads to see where the second seam needed to be. The two ends were again overlaid, and stitched roughly where I’d held them in place with my fingers. Once we had the circlet, we up the technical skills factor and cut the top into points, freehand. The big boys wanted curly-swirly medieval style crowns so they freehanded their swirls. The final step was to go nuts with the tacky glue and sequins to decorate. 15 minutes, tops, to make four crowns, I’ll call that a win of a project! The boys then proceeded to make swords as well and turned the backyard into a King Arthur role play. Today is my favourite kind of Friday – the last day of school Friday!! We have school break next week so today is all about tidying up loose ends and getting school work finished and the house clean ready for break. Poetry Tea Time has been read, bedrooms have been (somewhat) tidied, and next up is art class. We’ve had some really mixed up Fridays this session so haven’t been doing a specific artist, so I’m thinking its going to be “pile into mama’s craft room and make some mess” kind of art class today. The weekend beckons, and with it some warm weather, which has me dreaming of my hammock and a good book. The craft room is suspiciously clean, though, so I might have to go mess it up a bit too. Happy Friday, friends, I hope it’s an awesome one!